Trying to find a new job after age 50? You have come to the right place. I’m going to walk you through the steps and tips I recommend following to give yourself the best chance at finding a job after 50 years old. Networking is one of the best and fastest ways to find a job in general. And one advantage to job searching after 50 – you’re more likely to have a bigger network and connections who can help you find a job. You need to rely on these people if you want to give yourself the best chance of finding a job quickly. So think about former bosses, coworkers, colleagues, and even people you’ve supervised/mentored in the past. Who works in the industry that you’re trying to find a job in? Who has connections? Talk to these people, ask a question to get a conversation started. And most importantly, let them know you’re job searching! Nobody can help you if they don’t even know. Eliminate dates of graduation and other things that can allow for age discrimination on your resume. Also reducing the number of previous positions you include on your resume so that employers don’t rule you out based on age or being “too experienced” or “overqualified”. Fact: it’s your choice what to put (and what not to put) on your resume. If you have a 30-year career, you do not need to include your first job as an entry-level individual contributor if you’re at the Director-level now. Try to keep your resume to two pages, unless you’re in a profession that involves a lot of research, publications, etc. (like a Ph.D. Scientist). I recommend including a basic headline and contact info, a resume summary section, chronological work history ONLY including your relevant and somewhat recent work (go back 15 years maximum), and then a simple skills and education section at the bottom. If a hiring manager sees 4 pages of prior experience, they’re not going to read through all of it anyway. They’ll look at what’s most recent. Maybe the two or three most recent jobs, for example. And they’ll decide whether it seems like a good fit based on that. So focus your effort on making your two or three most recent jobs as impressive as possible by writing great descriptions and bullet points on your resume, and delete older jobs that aren’t as relevant or impressive. 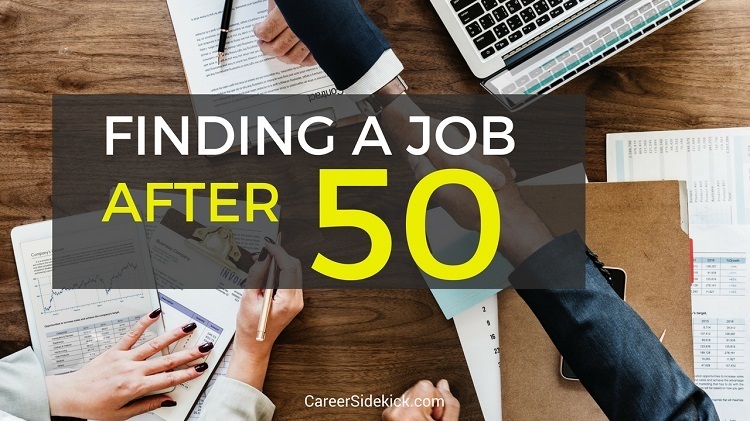 This can be a huge difference-maker when trying to find a new job after 50. Don’t forget to emphasize how your age and experience benefits you (and will benefit the employer). You can do this in your cover letters, and in the job interview answers you give. It’s easy to get caught up in thinking of your age as a hurdle or obstacle you need to overcome in your job search. And in some ways it is! I’m not saying it’s easy to find a job after 50 years old. But don’t lose sight of the fact that you also have some advantages and unique things you provide an employer. You won’t get hired for every job. Not every company out there wants to hire someone who is 50 or older. But it only takes one job to end your search. You only need one job offer! It’s *not* easy getting interviews, right? So you want to do everything you can to make the most of each interview opportunity you get. That includes practicing interview questions, and brushing up on your interview skills before you get on the phone or meet with any employers. Don’t just show your individual skills and ability to do the job in your interviews. Show you can mentor other people, contribute to the team, and be a positive influence overall. This is one way to make your experience be seen as an asset as a job seeker in your 50’s or 60’s. If you’ve encountered challenges or solved problems in the past similar to what the current team is facing, a hiring manager is more likely to offer you the job in the hope that your experience will be useful in this situation too. And the best way to convince them to hire you in these cases is to seem like a team player who is generous with your knowledge and experience, willing to mentor and teach others, and share what you’ve learned. The last thing you want is employers worrying about whether you’ll struggle with technology. That *will* stop you from getting hired. So show them how you’ve used technology in past jobs, or even in your current job search. Even mentioning you use a scheduling app on your phone, or a web browser extension like Streak for Gmail to streamline your job search might impress them. FYI Streak is one of the best ways to get organized in your job search in general. Highly recommended for saving time and sending job applications at the best times of the day. Note: capitalization does not matter in email addresses. I capitalized words in the examples above just to make them easier for you to read. Some hiring managers might be slightly uncomfortable with the idea of supervising someone with more experience than them. So, let them know you’re fine with the role you’re applying for and not looking to take their responsibilities or leadership. Make it clear you do not want their job and are expecting to take directions from them and follow their leadership. This will make you seem like less of a threat, and increase the number of job offers you get. Don’t waste time applying to a small tech startup where the average employee age on LinkedIn is 26. Do your research and focus on companies that seem to have other people in their 40’s and 50’s, and apply there. Viewing a company’s employees on LinkedIn before applying, and asking around in your network, are both good ways to identify companies like this. Are you turning down relevant opportunities and holding out for the “perfect” fit? Declining job offers/interviews, and being too picky, can extend your job search and stop you from finding a job after 50. At the very least, take interviews even if you’re not sure it’s the right fit. You’ll learn more in the interview (in fact that’s the whole point of interviewing – to find out more info and see if it’s a good potential match for both sides). And if you’re offered a position that has some interesting aspects and you think you can perform well in, take it. You can always change in a year if you want. I’m not suggesting you settle for something you don’t want. However, I am suggesting that finding a job, earning some money, and doing some work that’s in the field you want to be in will boost your confidence and help you kickstart your career. And it’s easier to find a job when you have a job. You’ll be more confident, less stressed/pressured, and employers will sense that. So if you have to take a part-time job and either take a break from job hunting, or keep searching while you work part-time, do it! Effort counts. The number of interviews you’re invited to is a result of the number of quality job applications you send out. So yes, you need to “tailor” your resume, you need to write a good cover letter if it’s required, and you definitely need a great resume to grab their attention. But you also need to apply for a lot of jobs! Not just a few per week. Don’t give up. Take a day off if you feel discouraged, but come back the next day and put effort in. You’re going to struggle to find a job after 50 if you don’t commit to putting consistent daily effort into your job hunt, and fighting through the setbacks and discouraging times. They let up on their effort or take long periods of time off when things aren’t going well, and they end up making the situation worse and losing the momentum they had. Finding a new job after 50 isn’t easy, but having a negative mindset, complaining, feeling jealous or anything like that will NOT help. It’s okay to feel those emotions occasionally. Everyone does. But move past it. Get back to putting in effort and focusing on what YOU need to do. And when you talk to employers, whether it’s verbal communication or emails like a follow-up after the interview, never sound angry, discouraged or bitter, or you won’t get hired. Stay positive, show employers you’re optimistic and confident in the value you bring, and you’ll give yourself the best shot at landing a new, high-quality job after age 50!